Kevin Sanders (left) with Steve Collins. British boxing great Steve Collins will be in Peterborough next week. Former world champion Collins has agreed to officially open Kevin Sanders’ new gym. City-based Sanders, who claims to be ‘a big pal of Collins’, runs the thriving Kevin Sanders Boxing and Fitness Academy in association with Peterborough City Council. 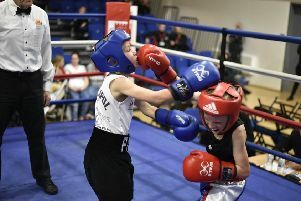 The Academy, set up in September 2015 as a place for disadvantaged youngsters to be steered away from trouble, has been operating at Vic’s Gym at Hampton and is proving very popular with city schools. But Sanders is moving to a new gym at Woodston - in Alfric Square - and he’s persuaded Collins to come along and perform the official opening ceremony at noon next Friday (July 14). “And anyone can come along and meet Steve,” said Sanders. It’s been mooted that Collins, the most successful Irish boxer in professional boxing history who held the WBO middleweight and super-middleweight titles, is keen to meet arch rival Benn in a third bout – 21 years since their last. Collins convincingly won both encounters in 1996, first by a fourth round stoppage then four months later on a six-round retirement. Money of course is the incentive but getting the fight lincensed could be the stumbling block. With Benn now 53 and Collins 52, the safety of both fighters will be an issue. Sanders, who was actually Nigel Benn’s trainer, refused to comment on the plan. Collins actually collapsed in training forcing his retirement 20 years ago. But if both are passed by the strict boxing medical it could be ‘seconds out, round three’ and millions would watch it.